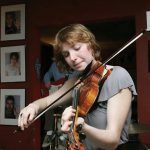 Saturday evening, Sept. 3, do yourself and your friends a favor: take them to hear American roots-based music at the Katharine Cornell Theatre. McConneloug and Broderick to ride for the US in world mountain bike championships. Husband and wife team win national tourney again. Stina Sayre's considerable fashion designing skills were on the runway at a benefit cocktail party and fashion show for Vineyard Youth Tennis (VYT) last Friday evening, July 29, at the Shephard Fine ArtSpace in Oak Bluffs. 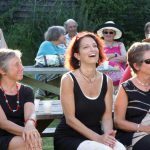 Writers and West Tisbury seem to go together, and now the former are going to bat for the library in the latter. 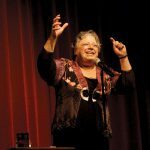 Susan Klein has been telling stories on herself for years. On Saturday, she recalled her Oak Bluffs childhood at a benefit for Habitat for Humanity. The Vineyard's first triathlon in more than 15 years is planned for Sunday, Sept.
Thankfully, the world did not end last Saturday as some had predicted. On Saturday, 615 folks of various ages and sizes and in various states of dress, although mostly in brightly colored tight-fitting riding attire, took off on their bicycles from the Martha's Vineyard Regional High School parking lot to ride around the Vineyard in support of the National Multiple Sclerosis Society's Accept the Challenge. 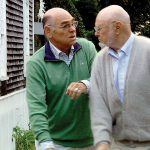 "Morning Copy" is a 10-minute short film about two aged men living across the road from each other in Oak Bluffs, with a shared passion to be the first to read the news. "Rodin's Debutante" by Ward Just, Houghton Mifflin Harcourt, Boston-New York, March 1, 2011. 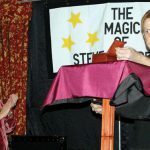 Magician Steve Charette, a Worcester native, brought his 40 years of performing experience to the Lambert's Cove Inn this past Saturday, Feb. The Vineyard Youth Tennis 2011 Round Robin Extravaganza held Saturday and Sunday raised $14,852 to benefit the nonprofit organization. Seventeen years ago hundreds of Islanders volunteered their time and skills to help raise West Tisbury's Agricultural Hall. On Saturday, almost 100 cyclists paid an average of $100 to ride their bikes around the Island in the second annual Cycle Martha's Vineyard. Satsang Lounge originators Misi Lopez Lecube and Lizzy Kent describe their event as "a modern day cabaret series that presents exciting new works by a rotating cast of the best up-and-coming local talents. "The Lead Balloon, Limericks on Martha's Vineyard" by Joe Eldredge, 2010, hUMILITY pRESS, West Tisbury. 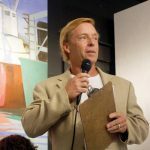 Attorney, college professor, and Edgartown summer resident for the last 25 years, Dennis C.
How many bands are there in the United States at any given minute? How many of them are any good? Probably more than is worth counting.